Roosevelt, AZ — As the pavement came to an abrupt halt on Apache Trail, it became apparent to me that my Mustang probably wasn’t the best choice of transportation for my journey to the Apache Lake Music Festival. This would be my first trip to the annual event celebrating it’s ninth anniversary in 2018. 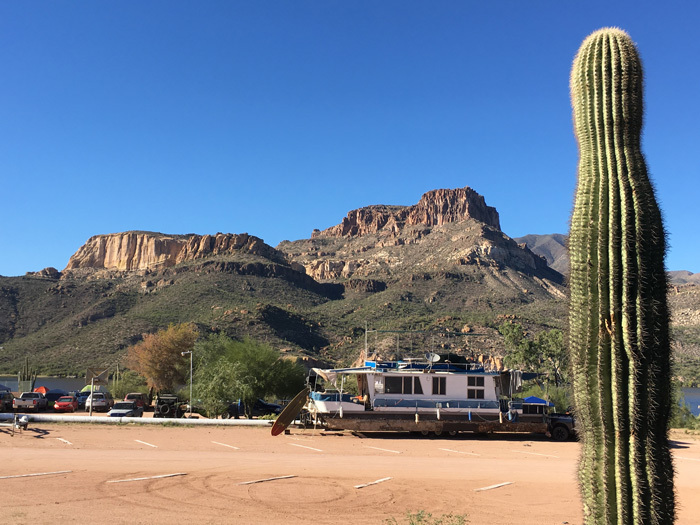 Every year, hundreds of attendees brave the treacherous cliffside dirt road winding through the mountains over single lane bridges to get to the Apache Lake Marina. The drive is excessively bumpy and requires near constant brake pressure during the 10 mile descent through the second half of the journey. I arrived late Friday morning around 9:45 am. Pulling up to the venue was a relief, considering I was still physically shaking from fishtailing around a hairpin corner mere feet from an impossibly high loft on the mountain just minutes before my arrival. Being my first time, I wasn’t really sure where to go or what to expect. 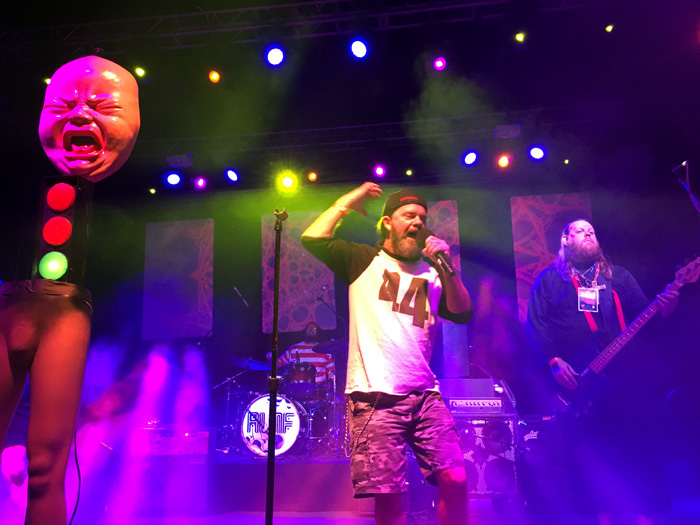 As I finished setting up my tent and dumping my gear into the unzipped opening, I heard the sound system up the hill come to life on the main stage. Cell service is almost completely devoid in the area due to its remote location, so I couldn’t pull up the schedule online to see who the first act was. 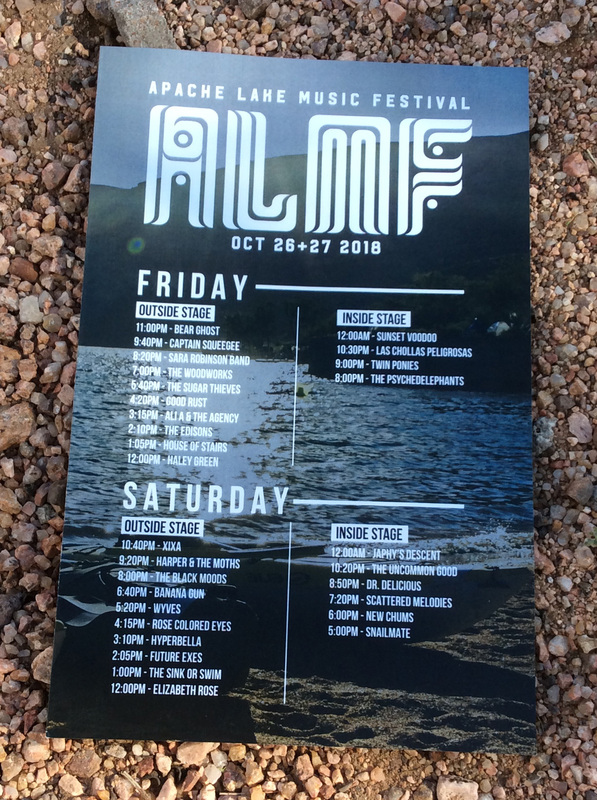 I decided to drop what I was doing, to trek up the hill to try to find a program or flier with a lineup and check out the first act. This would become a theme throughout the weekend; the back-and-forth up and down the thigh-murdering hill, to and from the main stage. Several groans later and I was back at the venue, heading down the short hallway from the entrance toward the sound system outside the rear doors. Haley Green was checking sound. The engineers were adjusting levels. All of the usual warm-ups were in play as more familiar faces began to appear. Sara Robinson was on the patio of the cantina sitting across from Tempe music legend, a hatless Paul “PC” Cardone. She arrived early in the morning after heading out at 11:00 PM the night before, recounting a veritable Murphy’s Law of road trips along the way. After chatting a bit, Sara and I made plans to meet later before her performance to gift my plus one ticket to a friend of hers who couldn’t afford to come. Sitting just a few feet away was the ever-present and always friendly Ryan Edmonds, longtime doorman at the legendary Sail Inn of Tempe and Cactus Jacks in Ahwatukee. After catching up a bit, the thirst was too much to bear. I badly needed a four-dollar gallon of water, and the convenience store was more than happy to oblige. I soon realized I forgot my phone at my campsite and headed back to drop off the water and grab some Fig Newtons. Back at my campsite, I retrieved my cell phone and began rearranging my sleeping gear for maximum comfort. I figured this was the perfect time to smoke that J that had been burning a hole in my pocket, so I sat on the edge of the boat ramp and lit up. It was an absolutely serene day. Seventy-four degrees and not a cloud in the sky. The lake was stunning. After I finished medicating, I did the dumbest thing possible in that situation… I laid down. The temptation to sprawl on my bevy of pillows was simply too much to ignore. 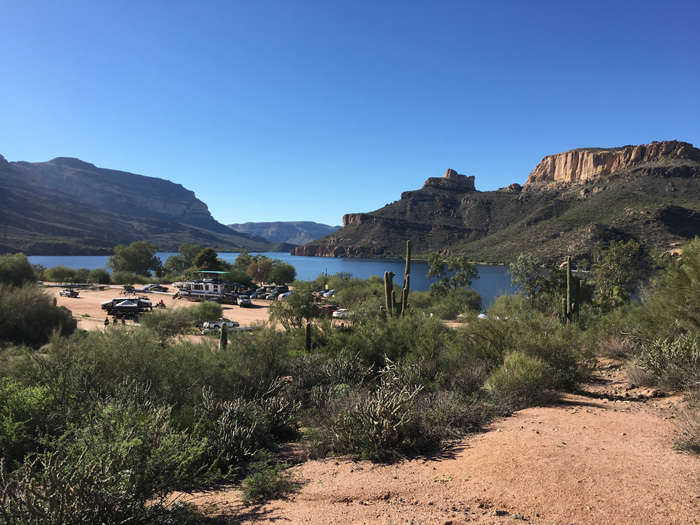 As I lay on my back staring up at the silhouette of mesquite branches, I began to drift off to the sound of Haley’s docile tones with the sun kissing my cheeks and the breeze bouncing off the cool water of Apache lake, wafting through the mesh of my borrowed palace. There were drum circles in the distance, dogs barking and people laughing. I never quite lost consciousness, but I was in that in-between phase of sleep when something stirred me to my senses. The most beautiful voice started to fill my tent. I immediately bolted upright, put my shoes on and once again, trekked up the hill. House of Stairs is a Jazz collective from Phoenix. 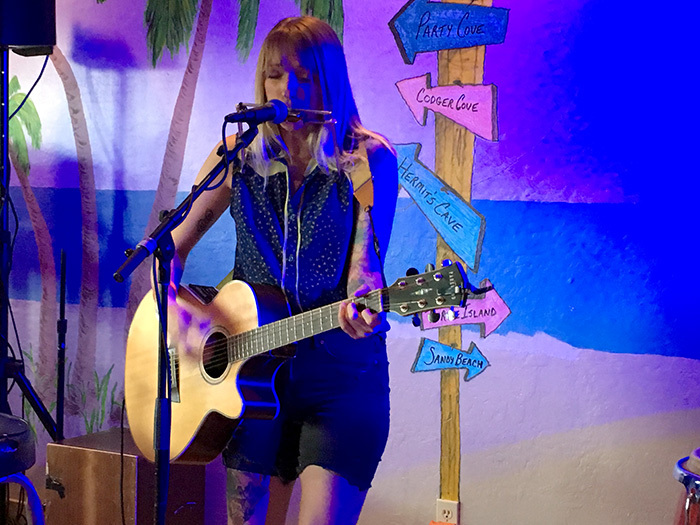 Vocalist and looping artist Holly Pyle has the voice of an angel, reminiscent of the late Cranberries songbird Delores O’Riordan. The soulful vibe of their music is befitting of the environment. The keys danced through the criminally small crowd witnessing this performance, but drew even more attendees in from the parking lot. Soon, a handful of people were swaying in front of the stage. Call it the “medicine”, but I was absolutely transfixed. Before long, their set was over, and I’m convinced it was far too short. It also seemed too early on the first day of the festival to put a group of this calibre on stage as there wasn’t quite a large enough audience yet to appreciate their brilliance. Soon after they left the stage, The Edisons were up next checking sound, and I abandoned any attempt at taking halfway decent photos with my iPhone. From my distant place at the lone picnic table, I spotted Joel Ekdahl of Manic Monkeys and Exploding Oranges at stage right taking photos. I was relieved to find shade in the VIP area backstage, but more importantly, FREE WATER. The Edisons performance was equally as impressive as House of Stairs. Indie Synth Rock becomes my flavor of the day. 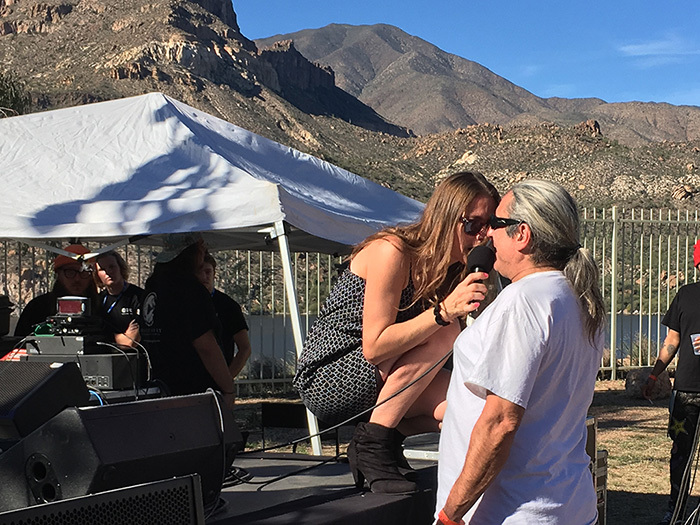 I eventually went back at the tent, attempting to make spotty communication with my festival host, Banter lead vocalist Kim Capria. Ali A and The Agency were killing it in the background as I cursed Verizon because my service was worse in the building than it was on the beach. Kim left Tempe with lead guitarist (and one of Burning Hot Events’ music journalists) Brandon Biallas around 1:00 in the afternoon, and I was growing a bit concerned. This was when I learned there were two routes one could take to Apache Lake. The shorter treacherous route or the longer, safer route. They had chosen the latter. Once we had established that they would be arriving shortly, I thought it would probably be a good idea to be there to greet them when they arrived. So again, it was up that damn hill. Seriously, how did Brandon Biallas get System of a Down for his first concert review?! Dude can write, so check him out. Kim and Brandon walked in at exactly 4:15, just 15 minutes shy of their performance. They were still awaiting drummer Spencer Ferrarin. We hugged our hellos and mutually bitched about the journey, and before I know it, Spencer materializes and is pretty much ready to go. Bassist Miles Tippet sat out the trio performance, but was milling about the grounds somewhere. The Banter’s set was fantastic. Kim was on point and the boys were in tune. “This is probably my favorite performance ever,” she tells the crowded bar. After they finish up, we made plans to go down to my tent and move it to their campsite. Luckily, it wasn’t that far at all. I was relieved that the tent I borrowed basically folds up into a compact log, making it easier to carry down to the beach. I was a little disappointed though. The Sugar Thieves were on and I really wanted to see them, but it was getting dark and we didn’t have much daylight left. My late father was a fan of theirs before I was. He introduced me to their music at Blues Blast one year. Although he passed away a couple of years ago, I still try to make it to as many of their shows as I can. 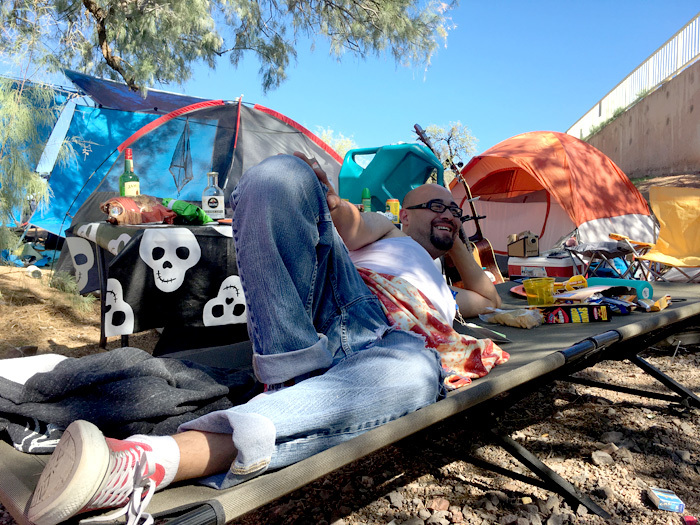 I could still hear Mikey’s growl echoing through our shanty town as we worked feverishly to unload trunks and inflate blow-up mattresses, so it wasn’t a total bummer. After a brief rest and quick change, we were back up the hill again for The Woodworks. Lead shredder and belter Meghan “Solo” Lounsbury was in the VIP area getting ready to take the stage. I drank more free water and suddenly noticed a prop staring at me. 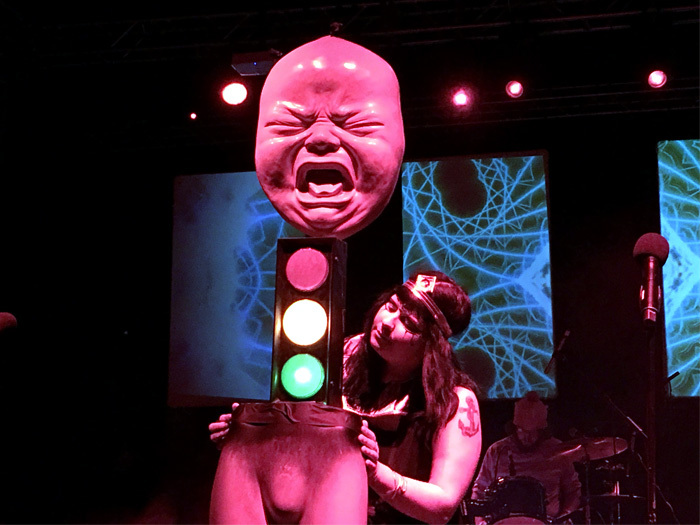 It was a giant baby’s face with a traffic light for a torso, on a pair of mannequin legs. It’s perfect. The Woodworks are one of the more unique staples in the music scene, bringing only the crunchiest of grooves. Solo dressed Cleopatra-esque, complete with Egyptian headdress. 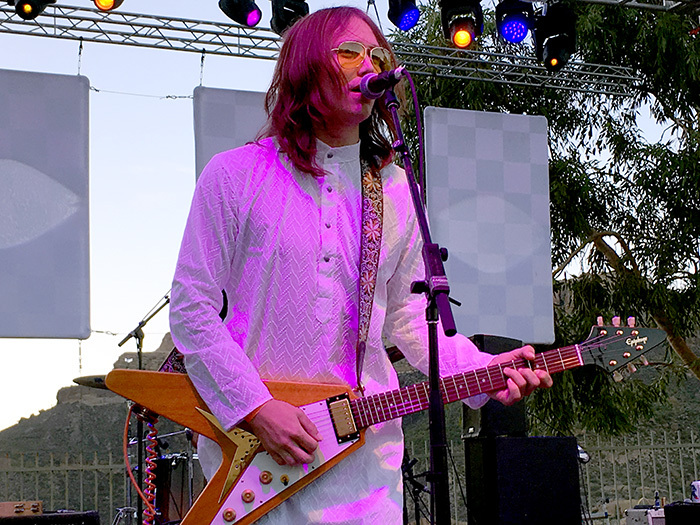 To open the show, the band brought up Future Exes guitarist and solo artist in his own right, Page the Village Idiot, kicking things off with his own personal brand of weird. If you’ve never seen him, you’re definitely missing out. This was around the time that things got a little hazy. The day had been long, the hikes longer. I was exhausted. I stayed for the entire incredible performance but I don’t remember how or when I got back to camp. I vaguely remember an Adam climbing the walls of the indoor stage, but I don’t recall if it was during The Psychedelephants. What I do recall was that they played an amazing set in that hot room wearing long sleeves. Spencer beat the drums like they owed him money, and Miles left enough sweat on the stage to put out a fire. Danger Paul kept the rhythm, and Calin Gross shredded faces. At some point, we were all just kind of “there” again, sitting in a circle on the beach. By that time, Miles had also materialized. He began plucking his acoustic bass as Brandon strummed away on my mandolin, and it progressed into a full on jam session with Kim singing the lyrics of a song I’ve never heard before. Throughout the night, there were conversations on topics ranging from individual band performances to our preferences of dying by falling off a cliff versus being eaten alive. 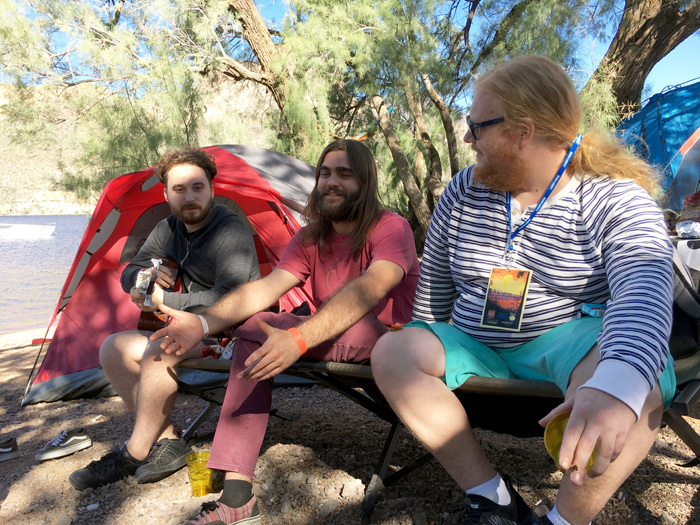 A random kayaker, who stumbled upon the festival and got too drunk to paddle back to where he launched, slept next to the fire that Scott and Max started with his help. The stars never looked brighter and campfire never smelled so good. Out on the lake, the swaying beacon of an anchored sailboat cast a singular blue glow as the inhabitants hooted and whistled to beachwalkers in the moonlight. Everything seemed perfect. This is exactly the spirit this festival seeks to inspire. The same laughter, chatter and spontaneous acoustic jam sessions from my nap earlier echoed through the night from the other campsites across the marina as we all sporadically fell asleep to the water lapping at the shores under the vast sky. I slept in the next morning. I didn’t wake up until close to 10:00 AM. Anyone who knows me, knows that this is highly unusual. I’m a restless sleeper and an early riser. I felt so at peace out there that I kind of just let my surroundings awaken me. 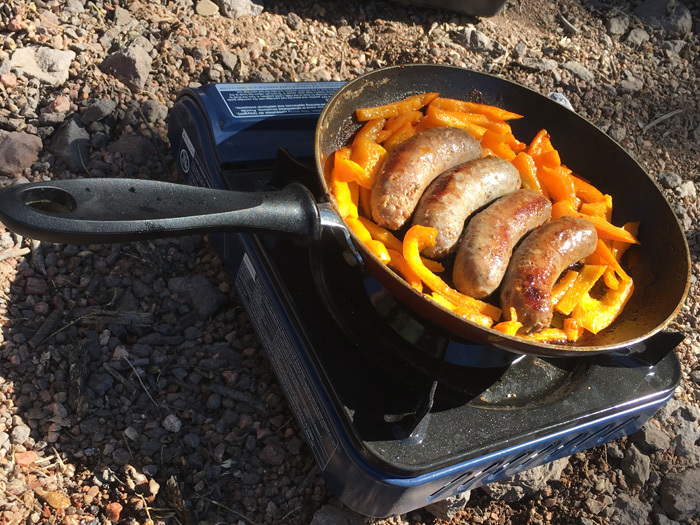 Kim made bratwursts for breakfast on a borrowed camping stove and served up cold brew coffee with almond milk for anyone who needed it. After two full cups, I made the two dollar sacrifice at the convenience store for a third cup of coffee with plenty of powdered creamer and sugar. Back at camp there were more jokes, jams, philosophies on life and chocolate salty balls — as a journalist, I think it’s important to note that Brandon put them in his mouth. I was told they were delicious. Apparently they were made of oatmeal but I never got an opportunity to confirm. Spencer reemerged and declared that he still hadn’t gone to sleep. We laughed some more and basically spent an exorbitant amount of time just being lazy. One of my favorite things about these weekend-long events is how amazed everyone is to see one another the next morning. Once I had regained my motivation, I made a point to trek back up to see Future Exes. 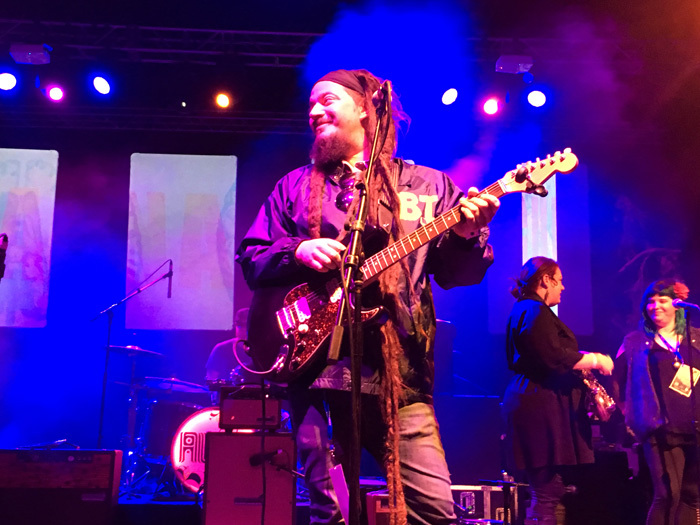 Something that isn’t immediately apparent to many festival attendees is that a lot of the staff is comprised of volunteers; some of those volunteers are actually band members. 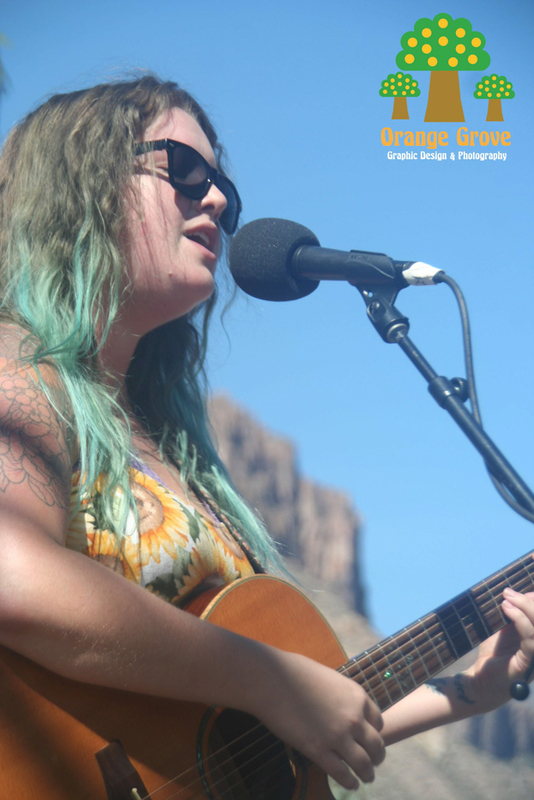 Roni Marie is the lead vocalist of Future Exes, and one of the lead event volunteers and organizers. Throughout the entire weekend Roni was omnipresent, sporting the yellow vest and walkie talkie. She’s one of the people making sure all of the gears are turning and everything runs smoothly. Future Exes is always a great band to see. Page is an amazing guitarist, and Roni is one of the most sultry singers in the community. 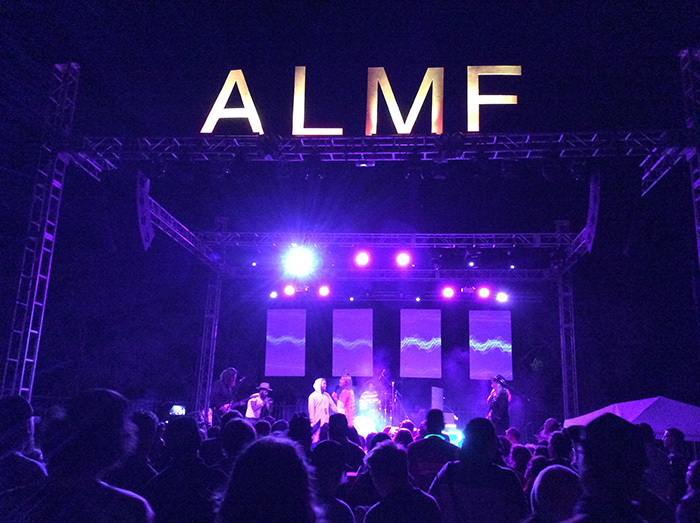 After the festival, she tells me, “There’s much more [work] behind the scenes before, during, and after the event that most people don’t see… We are all for sure proud of this year’s event and our music community as a whole. 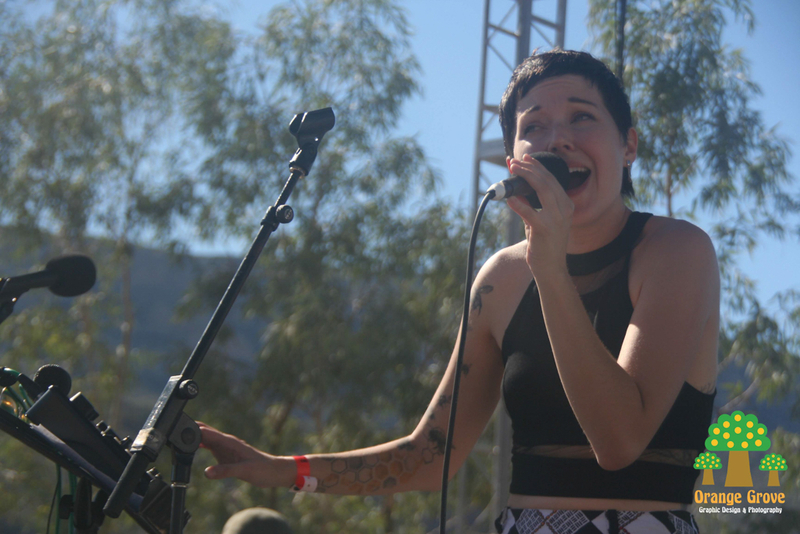 There’s so much love!” Their daylight performance on day two was as awesome as it always is. During one tune, Roni stepped off the stage into the arms of PC in one of the more memorable moments of the festival. These are all people that absolutely love and care for one another and it shows. After finishing their set, the band welcomed Hyperbella up to the stage, and as ashamed as I am to admit it, this is yet another band that I have totally overlooked. Like House of Stairs, they’re soulful, funky, and sophisticated all rolled into one. 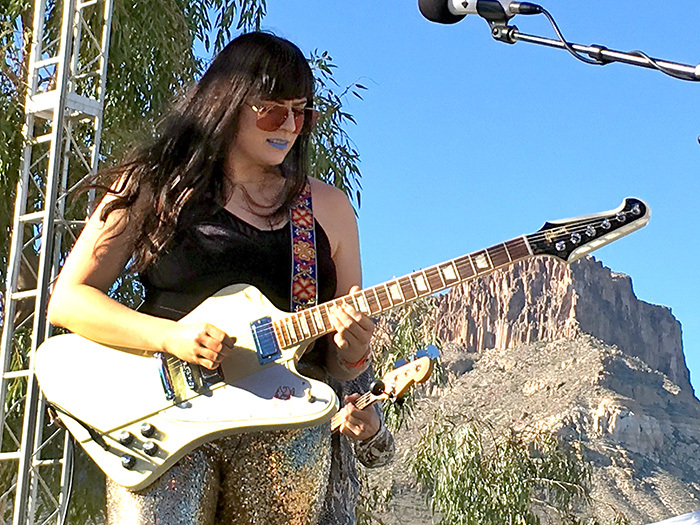 Vocalist and guitarist Cassidy Bates strokes her Gibson Firebird like a feline extension of her arm. Her harmony with Carly Bates on the keyboard is heart-melting, and it doesn’t hurt that they’re both insanely beautiful women. All swooning aside, drummer Marcus Leatham and bassist Brenden McBride (also of Wyves) are no slouches either. As a whole, they’re tight and in sync with an almost Bobby Caldwell-like essence, and they absolutely left me wanting more. I spoke briefly with Cassidy after their performance and she couldn’t have been more humble. Don’t make the same mistake I did with this band. Do NOT sleep on them. They’re one hundred percent worth whatever the cover is at the door if you can catch them. Back at the cantina, another performance from Tommie Victor with a fantastic cover of Megadeth’s “Symphony of Destruction” for an appreciative audience. Joel Ekdahl took a break from his camera to play an acoustic set shortly before the Banter’s second performance of the weekend. Kim wore her Kill Bill jumpsuit and several people remarked “She really does look like Uma Thurman!” With exhaustion once again creeping in and increasing pain crawling up my legs, I wandered back outside to the mainstage as the sun was disappearing on the horizon to catch the next act. Wyves has just come off the release of their second studio album R U OK? 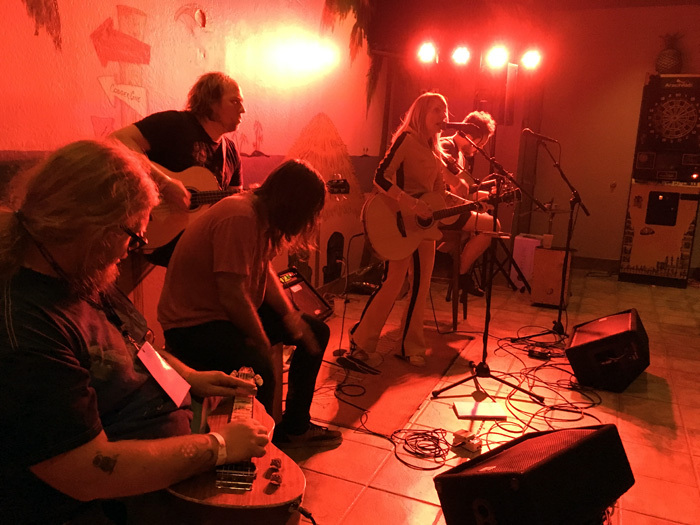 Cory Gloden, guitarist for Dry River Yacht Club, is ever the frontman, pumping the tired and inebriated full of newfound energy. This is the point where I completely gave up moving for awhile, and take a seat backstage to watch them absolutely murder it. Not only do they sound amazing, but they have so much style. These guys are legit rock stars. Looking over to my right, I saw that Page had the same idea and was looking worn out in a seat of his own. I attempted to take a photo of him before he pointed to my lens and asked “Are you watching me melt?’ with a hearty laugh. During one of their last songs, I suddenly realized just how full my bladder was and I slowly made my way indoors to the mensroom. Upon opening the door, another man rushed past me and I was hit with a wall of odor that stung my nostrils. Guys were covering their eyes at the urinals and making faces like children who had just bitten into a lemon for the first time. It literally smelled like piss and vinegar. I noped right around into the other direction and took my chances outside in the wild. The smell was so bad I had to pee in the bushes. When I returned, Wyves had sadly finished up and Banana Gun was now lugging their gear onstage. From a laughable distance I saw the familiar glow of an afro and I knew that Marc Norman had arrived. Banana Gun is one of those bands that makes it impossible not to embarrass yourself because you can’t resist the urge to dance. Their most recent album Dance Monkey Down in Faux Town is phenomenal. It’s also available on vinyl. Seriously, go buy it. I had to pick one up in person at a sweltering show at Yucca Tap Room this summer to get mine. You can order it directly from their website, so you have no excuse. Kevin’s dreads hang ankle length and swing like whips across the stage at times. Kyle’s sax punctuates every song like an exclamation point. This band is seriously just too good. From the first notes of their set, the whole place is up and jumping once again but the soles of my feet are getting the better of me and I remain seated. A few of us regrouped and decide to headed back down to camp. I knew in my heart that there was just no way I would be able to make it back up once we settled back down at the beach. I was so thoroughly sore. The moment I laid down on the army cot in the center of camp, I knew it was over and started to drift off, but something awoke me as I was on the cusp of my slumber. It was the sound of heaving. I had no idea where it was coming from until I decided to go investigate. Standing next to our campfire was the same kayaker who had crashed at our site the night before. He brought a friend who had apparently partaken in way too much of the festival. When things settled down and I was sure our new stowaway was ok, I went back up the hill for the closing of the festival, because nobody wants to watch another guy puke up pot brownies. I just couldn’t bring myself to miss out on the closing acts. Xixa (pronounces “Tsitsa”, not “Sheesha”) from Tucson did an amazing job, but I feel bad that I was too exhausted to truly appreciate it. I went into the cantina to catch Marc’s show, only to find out that it didn’t last long and I had missed it. From there, I waited for Page to close out the bar, but he never showed. I went into the next room to the indoor stage to try to catch Japhy’s Decent, but it was so crowded and hot that I gave up and went back to my tent for good. The one we called “Tiffany” half of the time woke us all up when she got back to camp, trying to get anyone she could to come to the hotel party with her. After pretending to be Brandon by throwing my voice in the dark for some time, I finally relented and accompanied her to the party. I’m glad I did. It was really an amazing thing to see such a group of artists sitting around, playing music with each other, talking about life and the creative process. Drum and guitar notes bounced off the canyon walls like a symphony, settling on the water. I was very lucky to be there, and to be welcomed by a truly loving collective of independent artists. I’m not sure how long I stayed, but it was long enough to smoke a joint with these beautiful souls and get back in bed shortly before 4:00 AM. The very next morning I was stirred from my sleep once again, but this time by the most beautiful smell known to man. As I unzipped my tent and poked my head out, our camp mate Alisha asked if I wanted a piece of bacon. “Yeah, I need a piece of water too,” I replied. With her dreads in a tower atop her head, she peeled a couple of pieces of the sweet pork flesh off of her plate and handed them to me. I ate them with my bare hands. Soon, everyone began to exit their tents like Who people in Whoville on Christmas morning. Bacon had saved us all. 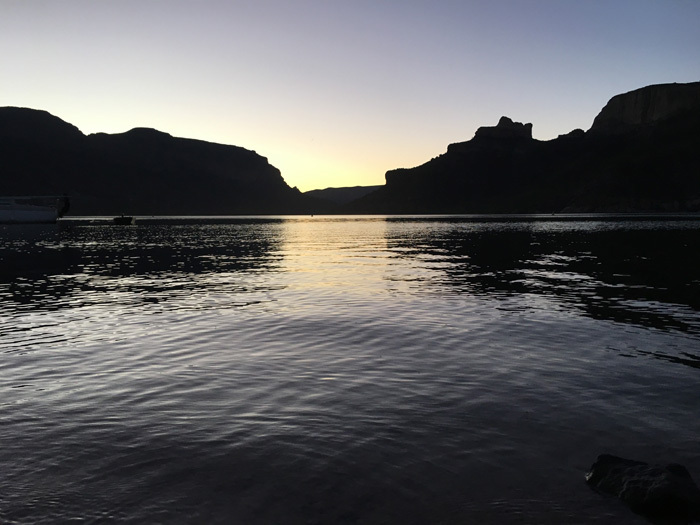 My initial plan was to pack it all up get on the road post haste, but once again, we were having such a great time talking and recounting the weekend that my sense of urgency to leave had faded, if it was ever there at all. I overheard someone say, “I feel like Marc Norman looks. My inner Norman is strong.” Calin played slide guitar on an old, painted acoustic that sat untouched for much of the weekend, Miles was at the shore teaching Tracy how to skip stones, and Spencer packed bowls and passed them around. My heart was impossibly full. 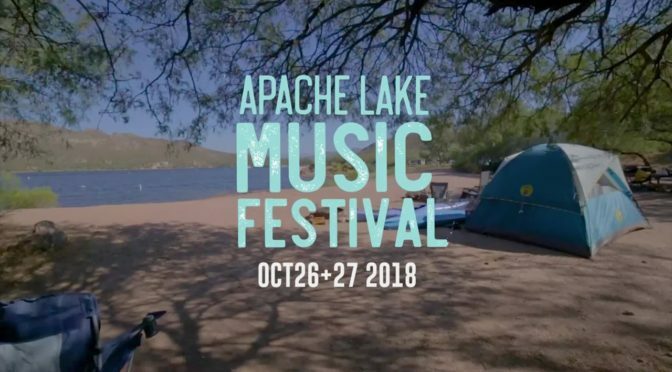 As all good things, the Apache Lake Music festival had to come to an end, and as much as we lamented, it was time to leave. Something I neglected to think about is just how hard it is to get dirt out of a tent. It’s like trying to get a pick out of an acoustic guitar. After making one more sweep of our campsite for trash, we were in our cars and I was following Kim’s car out of the the marina. I decided to give the long route out a shot since the short way in was so nerve racking. For the most part it remained wide enough for two lanes, save for a bridge. After reaching the Roosevelt Dam and getting back on the main highway, we made a quick pit stop at an IGA grocery store to use the restroom and clean our windshield. Getting out of the car was physically painful. My thighs were on fire. Standing and walking have never been so difficult. Shortly after our collective relief, were back on the road. Once we made the left turn onto highway 87 toward Mesa, I immediately burned out and left Kim and Brandon in my rearview mirror. My need for a shower was far too great to further soak in anymore scenery. 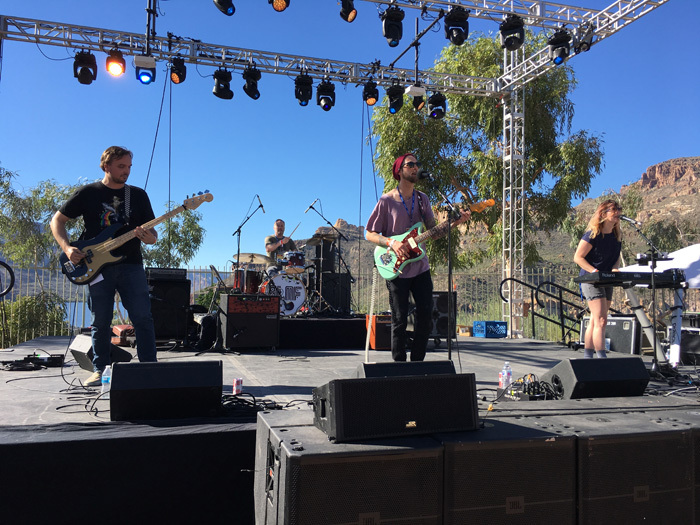 From the Bush Highway to Usery Pass, I was soon back on the 202 southbound, heading toward my home in Gilbert, reliving the sights and the sounds I had consumed that only the Apache Lake Music Festival can deliver.